Data from DeGolyer, Volume 76, pp. 316+, and from GN 1 - 1929 Locomotive Diagrams supplied in May 2005 by Allen Stanley from his extensive Rail Data Exchange. (Thanks to Chris Hohl for his 3 December 2018 email noting the correct firebox and evaporative heating surface areas.) Works numbers were 58480-58481 in June 1925 and 58528, 58542 in July. As designed by Baldwin, the Belpaire firebox on these oil-burning behemoths had no arch tubes and a combustion chamber that contributed 160 sq ft (14.85 sq m) to direct heating surface. However, the specs note that the firebox was to make provisions for a brick arch and tubes and that the engine and tender "be arranged for future application of Duplex or Standard Stokers". Indeed, the railway soon installed arch tubes that added another 64 sq ft (5.95 sq m). The boiler had exhaust steam injectors, and steam was distributed through 14" (356 mm) diameter piston valves. Baldwin calculated the tractive effort using the GN's preferred coefficient of .765 instead of the standard 0.85 and came up with 127,500 lb (57,833 kg).. The driving wheelbase of all sixteen drivers measured 43 feet 7 inches (13.28 metres). 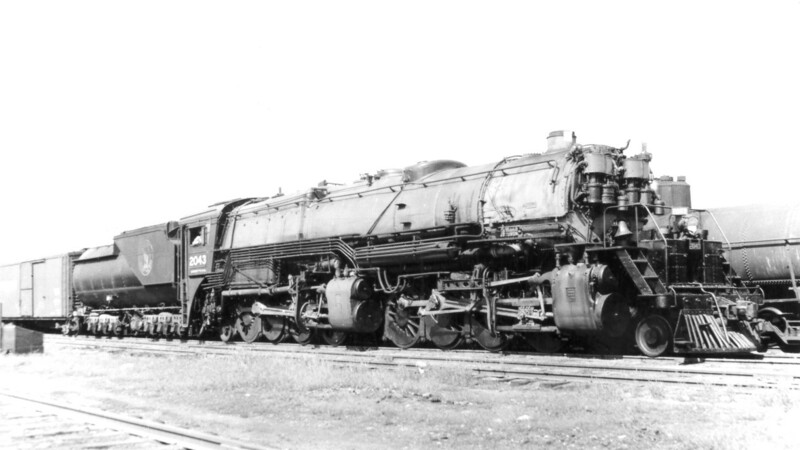 The cylindrical Vanderbilt tender had a flat top and two 6-wheel Commonwealth trucks equalized to give "equal distribution of weight on each axle." For the last ten R-1s built by Great Northern to modified specs at the Hillyard Shops, see Locobase 14966. 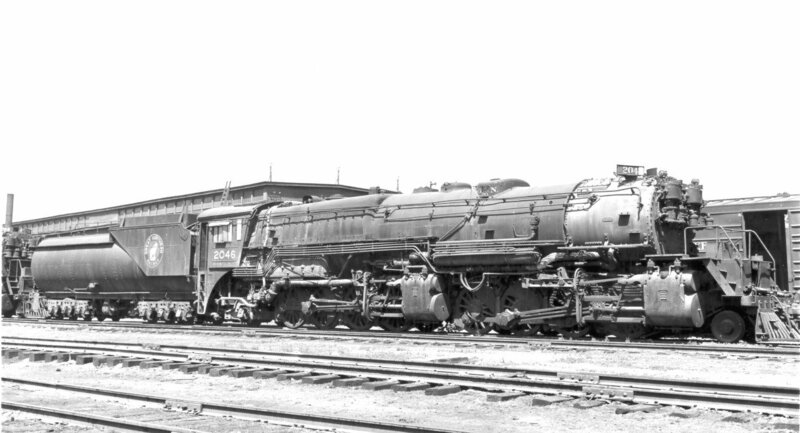 By 1952, the first three Baldwins had been retired to serve as stationary boilers in ore steaming service. Baldwin's 2030-2033 (Locobase 14996) may have seemed big enough to most railways, but the Great Northern wanted more power without a drop in the engine's factor of adhesion. So two years later, it rolled out very similar locomotives with more direct heating surface area, more weight on the drivers, and a boiler set 15 psi (1.03 bar) higher. Calculating the tractive effort using a coefficient of 0.765 instead of the standard 0.85 yielded 136,600 lb (61,961 kg). Even that wasn't big enough, so the Hillyard Shops turned out still bigger engines. See Locobase 321. Data from GN 1 - 1929 Locomotive Diagrams supplied in May 2005 by Allen Stanley from his extensive Rail Data Exchange. See also Charles R. Wood, Lines West (New York: Bonanza Books, 1967), p. 88. 2044-2053 were produced in 1929 and 2054-2059 followed in 1930. The Great Northern's continuing interest in simple articulateds produced this immense specimen that reflected the influence of the superpower revolution of the late 1920s and was a substantial expansion of the GN's home-built R-1s described in Locobase 320. Note the size of the boiler and the Type E superheater surface area. As delivered from GN's Hillyard Shops, The boiler was fitted with exhaust steam injector. The Belpaire firebox's heating surface included 178 sq ft (16.54 sq m) from the combustion chamber. A later upgrade added 78 sq ft (7.25 sq m) of arch tubes. Compared to the R-1s by Baldwin, these engines had 10% more EHS, 85.4% more SHS, and a 8.8% lower BDF. The GN calculated tractive effort after applying a coefficient of .765 instead of the .85 usually used. The result was a still impressive 146,000 lb (66,225 kg). Notice too that these engines grossed out at just over 501 tons(455 metric tons) with loaded tender. They were the biggest locomotives built west of the Mississippi. "As prime movers of tonnage on the GN," wrote Charles Wood,"they were unexcelled and reflected the continual search for bigger and better motive power that dated back to the days of James J Hill." The class operated from Minot, ND through all of Montana to Spokane, WA, reaching Great Falls, Mont from Shelby. Late in their careers, and in an unprecedented step, all R-2s were converted to a mixed cylinder diameter of 26" in front, 28" in the rear. See Locobase 14965 for the result. Data from GN 3 - 1952 Locomotive Diagram supplied in May 2005 by Allen Stanley from his extensive Rail Data Exchange. Boiler was fitted with exhaust steam injectors. The Belpaire firebox's heating surface included 178 sq ft (16.5 sq m) from the combustion chamber and a surprisingly high 142 sq ft (13.2 sq m) in circulators. Tube heating surface area as a percentage of total EHS increased, but still was smaller than a large number of American articulateds. The boiler's 2 1/4" tube count dropped by 15. Weight on the drivers jumped by a telling 24 short tons (21.8 metric tons) and overall weight grew by almost 28 short tons (25.5 metric tons). Tractive effort as calculated by the GN (which used a coefficient of 76.5% rather than the more usual .85) dropped slightly to 142,055 lb (64,435 kg). Dividing that value into the higher adhesive weight yielded a healthy 4.14 factor of adhesion. By 1946, only the 2047 and the 2054 retained the original cylinder volume.